The Pit Bull immediately strikes one as being a dog of power, passion, and undying willingness. The brick-like head, which is especially broad between the cheeks to house the powerful jaws,, is carried upon a thickly muscled, well-defined neck. The neck runs into a deep, thick, well-sprung chest. 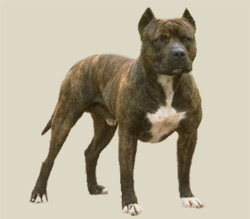 The American Pit Bull is a very muscular, stocky, yet agile dog which is extremely strong for his size. The ears are generally cropped, though this is optional. Docked tails are not accepted by the UKC or the ADBA. The eyes are round, and any color is acceptable. The teeth should form a scissors bite. Its coat is made up of thick, short, shiny hair. All colors are admissible. The tail tapers to a point. The APBT is a breed that is loyal to friends and family, and is generally friendly towards strangers. People have been known to be afraid of them because of their bad reputations. Nonetheless, an APBT can be a very congenial pet. Proper training can make the dog obedient and have a high desire to please. Without proper guidance, though, the breed can become dominant and destructive. According to the UKC, "aggressive behavior toward humans is uncharacteristic of the breed and highly undesirable. "A study done by the CDC showed that "pit bull type" dogs accounted for the majority of dog related fatalities in the United States between 1979 and 1996, though the study admits some limitations in its data. These attacks were proven to be by pit bulls that were highly under socialized. The American Temperament Testing Society shows a pass percentage of 84.3% for American Pit Bull Terriers. Still, a firm, even hand and early obedience training are best. They generally have a lot of energy and high prey drive ; they need exercise and stimulation in order to channel their energy properly and not become frustrated, bored, and destructive. The American Pit Bull Terrier is a dog that requires a lot of exercise. They have a lot of energy and if not allowed to wear some of it off, you will find them getting into mischief and doing destructive things around the house. Because they are so goofy and playful, they love going for walks with the family and just romping around in the yard, rolling around, being tickled and just being socialized with the entire family. In fact, until they actually mature, they are quite rambunctious and energetic. Most American Pit Bull terriers are enrolled in some sort of training, whether it"s obedience, agility or weight pulling and this is all great exercise for them and will make them happy as they love doing things with their family members.